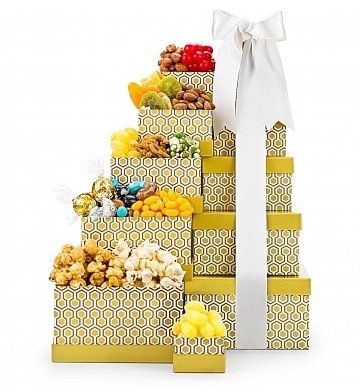 Everyone will enjoy this sophisticated take on snacking, with six exclusively-designed gift boxes filled with fresh nuts, old-fashioned candies, confections and much more. Gourmet Peanut & Chocolate Mix, Toffee Peanuts, Peach Slices. Old Fashioned Lemon Drops, Licorice Salmiak, Fresh Almonds. Crisp Pretzels, Wasabi Peas, Dried Fruits and more.